The Hangzhou-based firm rang up $17 billion in revenue during the third quarter of 2019. That’s a 41 percent increase from the previous year, but it also marks the slowest pace of growth since early 2016. Revenue from the quarter was driven by growth in the firm’s core e-commerce unit, the newly formed local services business between Koubei and Ele.me and its fledgling cloud business, which now commands more than half of the Chinese market, Alibaba executive Joe Tsai said (paywalled) this month. 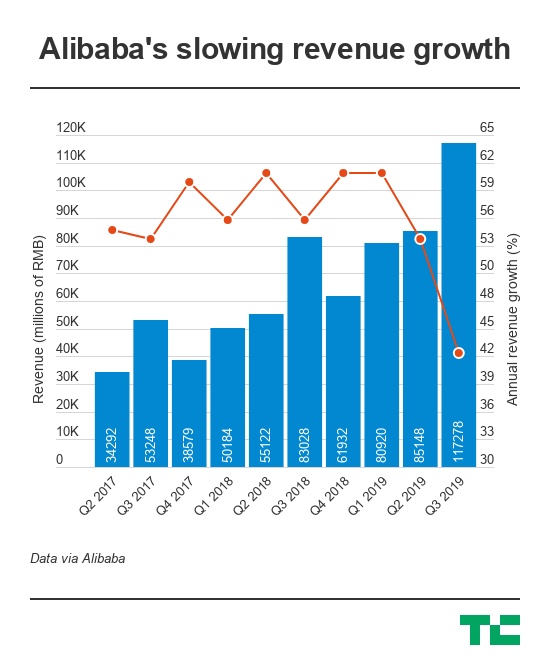 Revenue from Alibaba’s core commerce, “new initiatives” including local services and cloud computing was up 40 percent, 73 percent and 84 percent, respectively. The commerce arm is expected to kick up growth when the giant finally starts monetizing its revamped user recommendation system and search engine, features the giant launched last quarter. Alibaba said there’s no exact timeline for the rollout, but the redesigns have already boosted user engagement and purchase conversion. One highlight from the past quarter is the 33 million new monthly active users added to Alibaba’s online marketplaces on mobile devices, bringing the overall mobile MAU number to 699 million. Many of the new users are from third-and-lower tier cities, a victory Alibaba attributes to “simpler interfaces for first-time or less frequent users.” The giant has long coveted the next billions of internet users with a two-sided strategy. Aside from hawking products at them, Alibaba also enables farmers to sell rural produce to shoppers across China. Digital entertainment remains the more lackluster performer across Alibaba’s business units as it grew at only 20 percent year-over-year. Youku is besieged by Alibaba’s peers Tencent and Baidu, which each have their own video streaming business. Youku’s daily subscribers grew 64 percent in the past quarter, though it hasn’t announced the exact user base in recent quarters. Both Tencent Video and Baidu’s iQiyi recently claimed to have crossed the 80 million subscriber mark. Update: The title has been corrected.